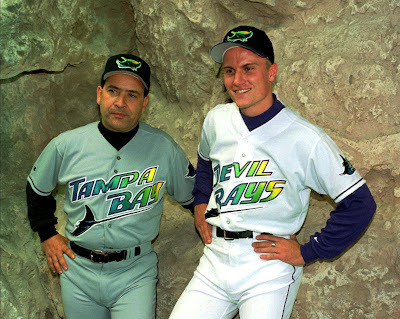 The original logo of the Devil Rays, 1998. The Jays lost a tough one last night to the Rays; the offence looked like it was still on the airplane flying over from Cleveland. 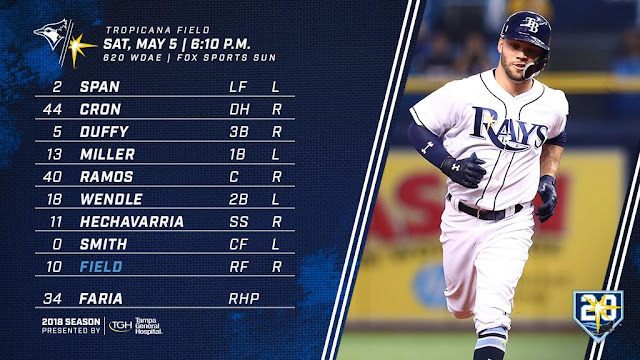 I'll give them a pass for that one, since it couldn't have been easy dealing with playing their fourth game in three days in three different cities, particularly since it was a very long doubleheader in feh conditions in Cleveland -- and the Rays had Thursday off to veg out at home. But only for last night; tonight, there's no excuses! Can Aaron Sanchez rediscover his earlier form after an up-and-down performance his last time out in Minnesota? 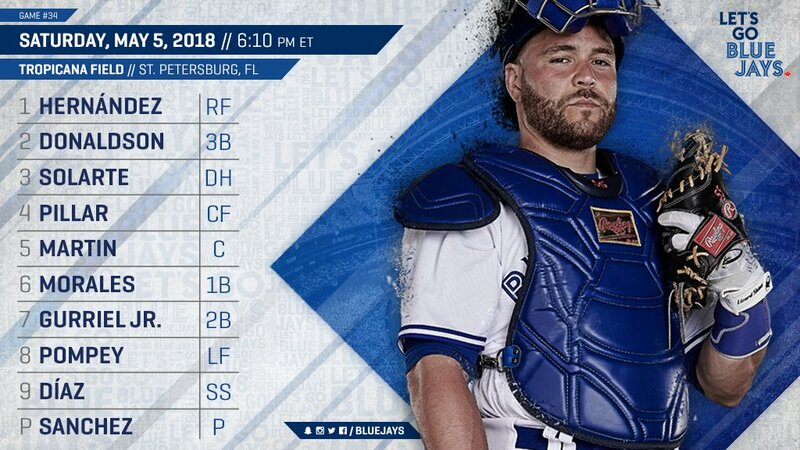 The Jays appear to be careful with The Sanchize in the early going of this season as they haven't allowed him to throw 100 pitches in any start so far, though he's thrown at least six innings in each of his last 5 starts after going 5.2 in his first start. At least he's been going deeper into games this year and haven't had any blister issues that have been reported (knocks on wood, throws salt over shoulder, and all that stuff). Curtis Granderson tweaked his right hamstring last night and was pulled from the game as a precaution. Dalton Pompey replaced him in last night's game and got a hit, so that was nice to see. Anthony Alford has also been called up from Triple A, so it appears that it might be more than just a day-to-day thing with Granderson, pending further news to come. Jake Petricka has been optioned and we're back to a 7-man bullpen. Steve Pearce was placed on the 10-day DL with an oblique strain. Justin Smoak is on paternity leave and is expected to return for Sunday's game. The Blue Jays are the only team in the majors with 10 players who have hit at least 3 HRs so far. In case you missed it, yesterday Jose Bautista wrote a heartfelt, thank you letter to the city of Toronto and the Blue Jays before he made his debut as a Baaaarve, where he hit a double to the wall in his first at-bat. Launch angle - Who cares? The ball left the stadium. Distance - See exit velo. The inaugural season of the Tampa Bay Devil Rays was 20 years ago this season; that team went 63-99 and had a still-good Fred McGriff and a 40-year-old Wade Boggs riding out his Hall of Fame playing and drinking career. Maple Leafer Rich Butler was also a part of that team.